The Police Action To Rule Again - Story on Cop Movies? The latest rage in the Tollywood, which become a roaring hit with the audience across the world. It fulfilled the decade-long waiting of the fans in general and Power Star Pawan Kalyan in special. The movie again resurrected the past glory and fame of the Star, which he is missing, since his previous films were not met the expectations in themes and box office collections. The important factor to be attributed for his stupendous success is,undoubtedly, his role of a Police Officer! So, the Police Characters have become a talk-of-the-town now in Tollywood! Pawan Kalyan, in Khaki Uniform had made the magic and spell-bind the audience with his style of histrionics in a Tapori Mass Police Officer. It seems that the 'Police Wardi', drafted a success formula for all the Stars on Indian Silver Screen in general and for theTollywood Heroes in particular. Thanks to the recent super success of police stories like Mahesh Babu starrer 'Dookudu' in Tollywood and Salman's‘Dabangg’ and Ajay Devgan's ‘Singham’ in Bollywood!. This is proved the fact again that, the audience is ready to take plunge in police action, where roaring aggression of the hero is magnified. Unlike the soft-sensitive-cool hero of ‘Dilwale Dulhaniya Lejayenge’ times, it emphasized the return of the ‘lost’ action hero, we missed from the long past on our films. Coincidentally, many other cop movies have lined up, like Ram Gopal Varma's 'Department' with Amitabh Bachchan- Daggubati Rana, Aamir Khan’s latest offering, 'Talaash' and ‘Rowdy Rathod’ of Akshay Kumar, now! It seems that, police stories have regained their crowd-pulling status as the latest ‘hit formula’! Here, it is noteworthy that, the police action films on Indian screen are not a new phenomenon. Their presence had started way back in 1955 with ‘Baazi’ of Devanandji! But it is with CID (1956), the Indian audience were drawn to the theatres. The film is produced by Guru Dutt and directed by Raj Khosla, while Devanandji had done the role of a police officer. Immediately followed by Shantaram’s ‘Do Ankhen Baraah Haath’(1957), it is established that, police stories appeal to the audience and will become commercial box-office churners. 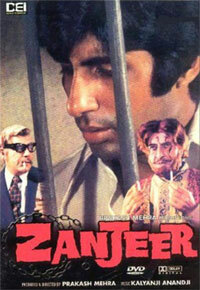 The journey of police stories on Indian Silver screen took a great impetus with Prakash Mehra’s Zanzeer (1973), where the stardom of Amitabh Bachchan and the introduction of ‘Angry Young Man Persona’ were reached its zenith. The movie had shown a larger impact not only on the viewers, but also the film makers of other regional films. They remade the movie with their native Heroes and tasted the success there too. The NTR starrer, ‘Nippulanti Manishi’ is the best example for it. Then it is Govind Nihalani’s ‘Arth Satya’ (1983), where a sincere police officer role was again made a super hit with the public. The Chiranjeevi’s ‘Pratibandh’, Manoj Bajpai’s ‘Shool’(1999), Aamir Khan’s ‘Sarfarosh’ (1999), Ajay Devgan’s ‘Gangajal’ (2003) and Salman Khan’s ‘Wanted’ had carved their own niche in the world of police movies in Bollywood. One more cop story, ‘Force’ of John Abraham had done well all over India and overseas and created an image make-over to him and made it a big success in his career. All these movies have magnified the emotional action at 'larger-than-life' style and presented Heroism like never before. The language, region and culture may differ but it is the human emotions which are same and universally equal to all of them. The Telugu audience are also no exception in this case. They are enthralled with the police stories on screen and made those films a super hit at the box office. NTR's 'Nippu laanti Manishi' (a remake of Zanzeer), 'Kondaveeti Simham' are the movies to name a few, which paved path for establishing the powerful persona of NTR in the minds of the millions, after his Mythological Films. No doubt, the cop stories had brought him the Mass Hero Appeal and as the savior to poor masses on screen! Dr. Rajashekhar’s ‘Ankusham’ had created a sensation in Tollywood and made a land mark in the journey of cop movies in Telugu filmdom. So, every top hero of the Tollywood had played a powerful cop in more than one film to hype their heroic status with the mass audience. Chiranjeevi’s 'Jwala' &‘Rakta Sindhooram’, Balakrishna’s ‘Rowdy Inspector’, Nagarjuna’s 'Nirnayam'& ‘Rakshana’ and Venkatesh’s ‘Gharshana’ are such movies to name. In the recent times, Mahesh Babu and Raviteja were also made the same magic with “Pokiri” and ‘Vikramarkudu’ respectively and come out with blockbuster hits! On the other hand, the women-cop stories were also got good response from Telugu audience. The Sharada starrer ‘Pratidhwani’ and Vijayashanti’s ‘Kartavyam’(it won National Best Actress Award to Vijayashanti) were made that miracle. Basically, the movie is a psychological game played with the feelings, thoughts and emotions of audience. In addition to it, the psychologist, William McDougal has viewed the human personality as the complex combination of various ‘instincts’. He further interpreted that, the instinct like ‘Agression’ make a human persona. This innate instinct of the audience may be satisfied with the movies of police stories by ‘identifying’ themselves with the protagonist on the screen. The emotional aggression and powerful mass elements enshrined in these 'Police Movies', might have motivated the public to raise their ‘Adrenaline’ levels and proved time and again that, portrayal of an ‘Aggressive Instinct’ is the hit formula of a mass movie. And who else can pump the high voltage emotions and resurface this Agressive Instinct of the viewers than a Police, in our films?